If you’re seriously considering buying a home within the next few years, you need to hear this. A lender sent me a rate on a 30 year fixed mortgage of 4.75% yesterday for FHA and VA and 4.875% for conventional loans. These rates are near 50 year lows and they will not last. We thought we’d seen the last of them a few months back, but the European scare seems to have nudged the FED back down a bit. In Baldwin County, sales have increased near 20% from this time last year, but prices have remained steady. Most experts feel that prices will likely remain level for 1 or 2 more years before modest appreciation can begin – but rates can’t stay this low. If you’re just looking out of curiosity or to stay abreast of the market – that’s fine, I want you to continue using our services as much as you want. But if you actually need to buy a home in the next few years, don’t let this opportunity pass you by. Call me to get this process started and to narrow the search for your next home. We, here at Fairhope Realty Group have the tools and expertise to find you the right home for the right price – and to walk you through the process every step of the way. Also, if you’d like more information on the Fairhope, Orange Beach, Gulf Shores, Daphne or Baldwin County markets, or on specific properties down here, feel free to email me at Terryl@FairhopeRealtyGroup.com; or call me at 251-990-8838. You can also visit my web-site and search the MLS on your own at www.FairhopeRealtyGroup.com. Well maintained split floor plan in quiet subdivision in Foley, convenient to schools, shopping and beaches. With large bedrooms, lots of storage, separate living room and den and attached double garage, this home is a must see. New dimensional roof, front and rear porches with low maintenance brick and vinyl exterior. Large, extended concrete drive with room for an RV in the back. Appliances negotiable. As always, if you?d like more information on the Fairhope, Orange Beach, Gulf Shores, Daphne or Baldwin County markets, or on specific properties down here, feel free to email me at Terryl@FairhopeRealtyGroup.com; or call me at 251-990-8838. You can also visit my web-site and search the MLS on your own at http://www.FairhopeRealtyGroup.com. As always, if you’d like more information on the Fairhope, Orange Beach, Gulf Shores, Daphne or Baldwin County markets, or on specific properties down here, feel free to email me at Terryl@FairhopeRealtyGroup.com; or call me at 251-990-8838. Great home in Stratford Glen at a great price! This 2005 4/2 has been well maintained & upgraded with hardwood floors, tile, gas-log fireplace, separate tub in master. Rear porch has been taken in with AC or additional storage/playroom. Large fenced back yard, spacious double garage and lots of closet space make this centrally located home a must see. Seller is motivated so call me to show. Beautiful custom-built home in the heart of Downtown Fairhope. Blocks from downtown shops & Mobile Bay. Totally accessible floor plan w/attention to every detail throughout. Authentic pine floors, crown molding, 9′ ceilings, solid wood doors, large elevator, upper balcony on Church St., separate D/S suite. Fenced yard w/patio, oversized double garage w/lots of storage & parking & so much more..
It’s a glorious, sun shiny day along the Alabama Gulf Coast. The sun is sparkling across the surface of the gulf. There are ABSOLUTELY NO EFFECTS from the B.P. oil spill on our coastline. It’s been a month since the oil rig explosion in the Gulf of Mexico. 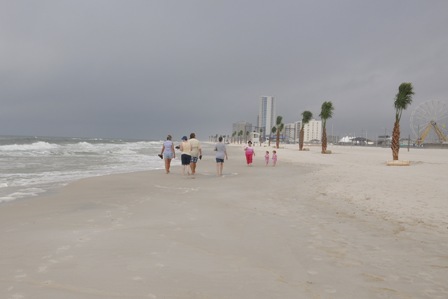 In the past 30 days Orange Beach and Gulf Shores experienced no environmental impact. Trajectory maps continue to predict oil will not be on shore in our area for the next 72 hours. NOAA only extends the forecast out for 72 hours. The gulf waters and inland waters are OPEN in our area. Fishing is good and boats are leaving the docks everyday. The authorities continue to prepare and stage equipment at strategic locations. Their personnel remain alert for changes in conditions. Click here to see the latest NOAA trajectory map. Click here to see the latest NOAA offshore trajectory map. Beautiful golf course home near Point Clear in Fairhope. Classically appointed with heavy moldings, custom cabinets and gorgeous hardwood and tile floors. Split floor plan with oversized garage and bonus room upstairs. Glamour master bath and gourmet kitchen w/stainless appliances. Near downtown Fairhope and the Grand Hotel and priced to sell quickly – don’t miss this one. We’ll, it’s been nearly a month since the Deepwater Horizon oil rig exploded in the gulf killing 11 men and beginning the oil spill off of our coast. While this is a horrible situation and our hearts go out to the families of those men – I am simply amazed at how well the slick has been contained. 2-3 weeks ago news crews from across the globe were here filming here and projecting doom within hours for the entire coast. Fortunately for us, the worse case scenario has not taken place. Due to the nature of the oil, natural and man made disbursement agents, and a huge amount of physical booming and burning, there is no sign of the oil apparent from the Alabama or Mississippi coasts. The only indications from the coast that anything is different than usual are the staging areas and protective booming stretched along the coast. While I understand that we’re not “out of the woods” yet, every day that passes allows the crews to prepare and protect our coastal area better and better. And living here, on the coast of Mobile Bay, I want folks to know the truth. The media has a vested interest in selling the “bad news” but they often ignore the positive. The erroneous perception has hurt the area economically and, unfortunately will deprive many families of well deserved vacation time on Gulf Coast beaches this Spring and Summer. So help us spread the word that all is good, the sand is white and the water is crystal clear. At the end of the day we will have learned from this experience and will have better protections in place to prevent and even better contain any possible future incidents. Great Home in Sought-After Timbercreek Priced to Move! Beautifully elegant home with open plan, gorgeous hardwood floors, custom cabinetry, heavy moldings and tons of extras. Large deck in rear on professionally landscaped, over-sized lot. Tons of storage. Large study can be used as 4th bedroom. Built out basement and walk-in attic not included in square footage. Priced to sell, this home is a must see for Timbercreek. If you have a client that may be interested in this unique property, please call me for an appointment to show. If you’d like more information on the Fairhope, Orange Beach, Gulf Shores, Daphne or Baldwin County markets, or on specific properties down here, feel free to email me at Terryl@FairhopeRealtyGroup.com; or call me at 251-990-8838. All beaches across the island are clear. The water quality is very good – no signs of oil film or debris. Tell your friends and come see for yourselves! There have been no reports of oil odor along the beaches of Gulf Shores, Orange Beach or Fort Morgan. At its closest point, the slick is approximately 50-60 miles away from the most western tip of our island. Fishing and recreation waters are open in Alabama. Prevailing breezes continue in a south-westerly direction, pushing the oil spill away from Alabama beaches and inlets. Sub-sea, surface, and shoreline efforts continue to contain effects from the oil spill. Berms and oil absorbing barriers are strategically placed along the beaches and inlets. Shoreline cleanup crews and equipment are standing by, if needed. You are currently browsing the Fairhope Realty Group blog archives for May, 2010.